his Word,” is out, I remembered an article in “Science of Mind,” or maybe I was organizing and just found it—who knows. I don’t know about you, but I can rarely trace the “actuality” of the trail that leads me to start either a piece of writing or a treasure hunt for greater understanding of a fleeting insight. 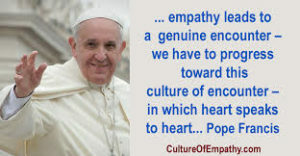 This article didn’t contain any direct “heart and mind” quotes, and when I looked on-line, I couldn’t find any there, and yet I feel confident that I’ve heard the Pope speak them and that the writer of this article, “A Compassionate Heart, a Courageous Soul,” one of Pope Francis’ U.S. editors, describes this language accurately. He did so in ways that sounded just like A Course of Love. And so, I let A Course of Love speak for itself, and share some of what Jesus says about this union. 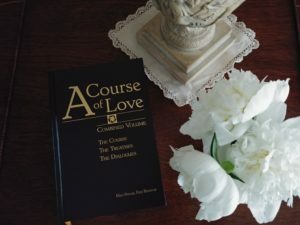 I.1 This course was written for the mind—but only to move the mind to appeal to the heart. 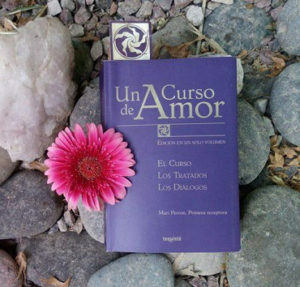 C:21.7 No matter which path you follow, the path of the mind or the path of the heart, you will not get where you are wanting to go until they are joined. You might imagine three paths—one path representing mind, one path representing heart, and one path representing wholeheartedness. The path of neither mind nor heart alone will take you where the path of unity will take you, and the journey will not be the same. C:29.5 Wholeheartedness is unity regained. Your return to unity is your return to your full power and your ability to be of quite literal service to God and your brothers and sisters. C:29.20 Choose anew and let the power of heaven come together to seal the rift between your mind and heart, and make you whole once again. Through mindfulness you will remember who you are. T1:6.4 Union is the mind and heart being joined in wholeheartedness. It is your union with your Self. Union with your Self is union with God. D:7.8 [A]ll that lives is from the same Source, and there is nothing more alive than mind and heart combined in the spirit of wholeheartedness. D:12 We are, in Christ consciousness, one Christ. We are, in wholeheartedness, one heart and one mind. Pope Francis is spoken of in terms of “his humanness and his divinity” in one breath, and in another, of his “simplicity, authenticity and honesty.” With our embrace of wholeheartedness, this is our promise too.